What began as a blog about experimental forms of architectural historical production is increasingly taking on the structure of an office – lots of commissions (visual and written), teams working on those commissions with various technical expertise from rendering to translation, and friends chipping in at the last minute to help realize projects on shoe-string budgets. What is most striking to me about this new and more expansive and collaborative way of working is that I increasingly use the term “we” to describe the realization and ideas behind these projects and commissions. It’s quite a shift from the pronouns most historians use to describe their work; a monographic architectural history book can have eight pages of acknowledgements of the various archivists, collaborators and friends who helped make the book possible, but the idea of sole-authorship permeates it and often the conclusion of the acknowledgement section asserts the individual authorship of the work. That is not the case with the projects staged here. 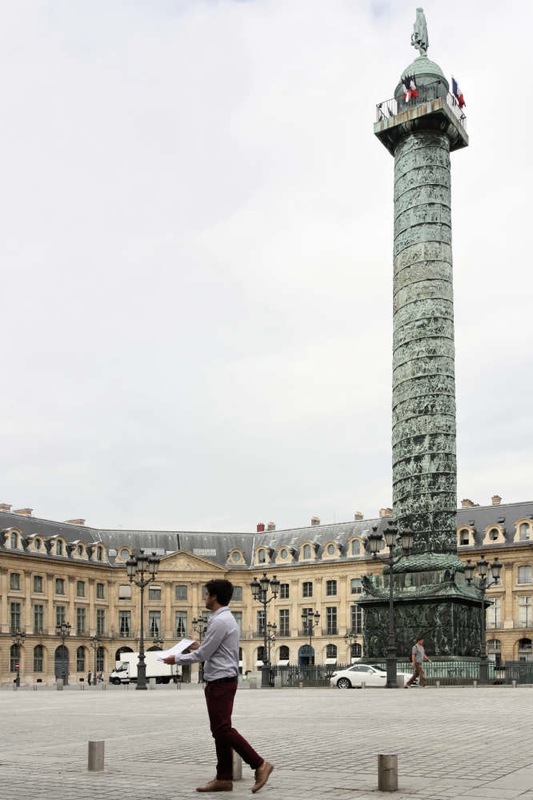 Last year, we realized the Museums of the City project, which marked a shift in the seriousness of the experimental projects that interest us; and this year, we have been commissioned to transform the Mound of Vendome into an installation. This is for a very interesting and large exhibition at the San Francisco Art Institute — “Temporary Structures” – that opens in mid-September. The curators — Glen Helfand and Cydney Payton — wrote that the exhibition “explore[s] the allure of temporary architecture—the form of the pavilion—as a site of human interaction, spectacle, and fun.” I am very excited to see what other artists and conceptualists stage in this exhibition. 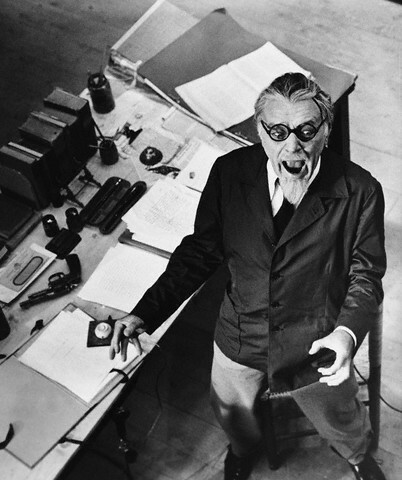 Our installation of the Mound takes its cues from a historian’s work-place – that mix of objects, texts, primary and secondary source material, and mementoes that litter our desks; but in this installation such a space is abstracted and recast as the workplace of some mad-anarchistic and experimental historian of architecture (That image below, is Richard Burton playing Trotsky, but look at the desk and you get the idea). What you will see assembled on this ersatz-work space is the plotting of the mound’s realization – a model, a petition, historical images, mementoes, etc. The various components of its pieces will be finished in the upcoming weeks, but here are a few photographs of some of the elements. 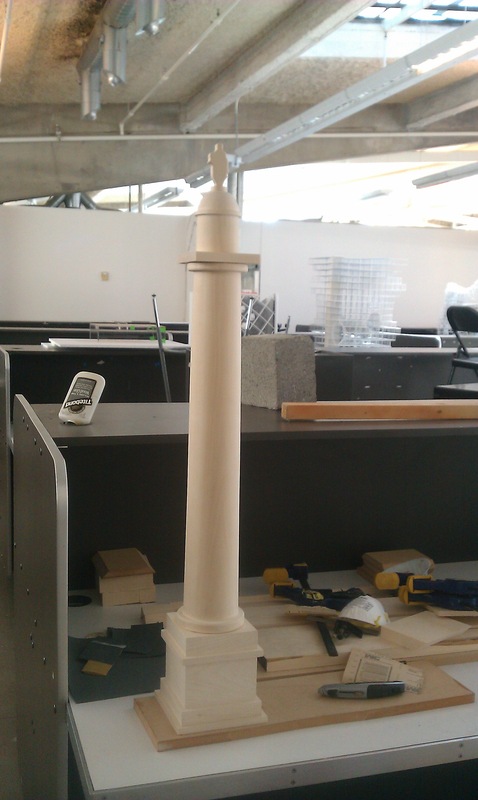 The column model that you see below (with its miraculous wood turning) is the work of CCA Graduate student Lawrence Davidson, and the photographs in the Place Vendome — of petitioning for the mound’s reconstruction — were generously staged and taken by some of my favorite young French architects, Nicolas Dorval-Bory and Raphael Betillon. I owe them a huge debt of gratitude. 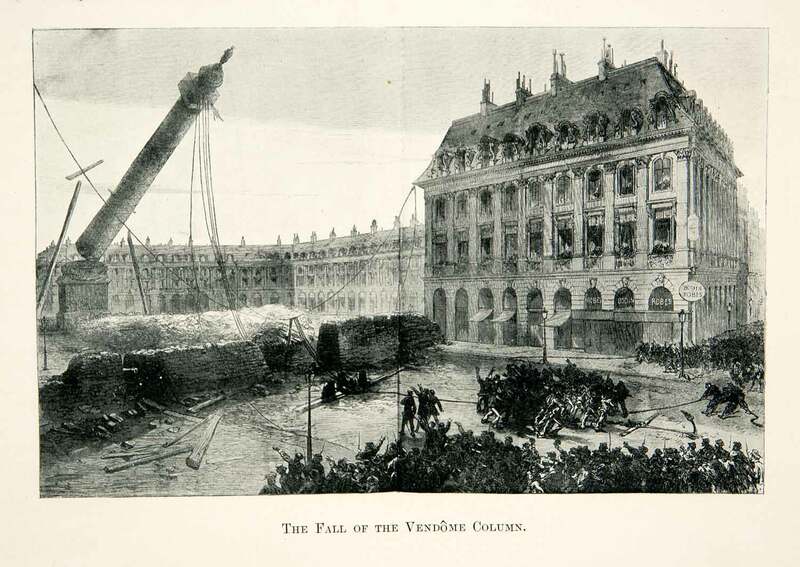 In exploring the mound and images of the toppling of Vendôme, we may now hold one of the largest historical collections of Vendome mound etchings – a few of which will be shown as well. Another CCA graduate student, Alix Daugin provided the translation of the project’s petition and Victor Hadjikyriacou (who rendered the Museums of the City) rendered the project in its first form.